This is probably her favorite dress. Let’s say it’s her favorite non-pyjama dress or, perhaps, her favorite dress that actually belongs to her. I don’t always let her wear it. I try to push it to the back of the closet sometimes… especially on school days but school’s out for Avery so pretty much everything is fair game. We went through this with Chase too. The whole needing to wear a dress and fancy shoes thing and then trying to climb stuff. It wasn’t until just this year that Chase would agree that running shoes were probably her best bet for heavy duty fun. These ruffles don’t seem to slow her down however and, even though I was wearing perfectly acceptable footwear, I’m the one with aching feet. And nobody even cares. Not even a little bit. I’m so excited to have worked on this over the weekend. I hadn’t seen this book yet but I love, love, love the idea of Improv Sewing. It’s pretty much the only way I sew. I also made three pairs of bloomers over the weekend using a pattern I traced when Avery was a baby and fabric I bought when Chase was a baby, followed none of the instructions and had a great time! This dress started as a drapey woman’s tee. It had drapey sleeves with slits in the tops. It’s hard to see but this is the only before picture I took. Avery immediately loved this shirt. To her it immediately looked like a dress and it was VERY difficult to get her to take it off in order to make any modifications at all. Anything I wanted to do had to be done while she was sleeping. She’s probably worn it 5 out of the 6 days it’s been in the house. I started by cutting off the drapey sleeves, cutting the shoulder seam and re-closing the shoulder with a simple knot. I took in a couple of inches on the side and fixed the arm scythe… aaaand that’s pretty much it. That was pretty much all she would allow me to do. She just really likes it the way it is and, frankly, so do I and so I didn’t really follow the instructions (shocker!). Though because I felt like a slacker I added some appliqued hearts one night. I was really, REALLY worried about the addition. I was afraid she would take one look at it and collapse in a heap wailing about how I RUINED her dress but I got lucky and she loved it. Has that ever happened to you? We have this cute little sundress that I made when Chase was little but Avery won’t wear it because it has two decorative buttons. I mean honestly. Makes me crazy. These lovely ladies are inviting anyone who’s inspired to stitch up their own two-tee dress to sew along (merrily, even) and share pictures in the merrily we sew along flickr group. 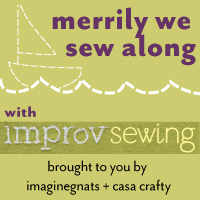 … and don’t miss the posts from our lovely sew along co-hosts: casa crafty and imagine gnats! episode four: two-tee dress is sponsored by Creativebug. we’re excited to tell you that the winner of this project will receive a one month subscription to the fabulous classes on the Creativebug site! perhaps you fancy learning how to crochet at midnight or have a hankering to paint in your pajamas? as a Creativebug member, you’ll have unlimited access to all of their workshops, anytime. featuring workshops from some of my favorite artists like Liesl Gibson, Kaffe Fassett, Anna Maria Horner… and even improv sewing’s Debra Immergut and Nicole Blum, you’re sure to find plenty of inspiration. so, stitch up yourself a two-tee dress and share a picture in the merrily we sew along flickr group by april 30 to be entered to win!! we can’t wait to see what you stitch up.